It helps you can run some software designed for XP. 1. Ez mode ... It applied in folder only mode. (Check Ez KD Registry . Click Ez Setting after reboot.) * It is safty. 2. Full mode ... Replace System file mode. (Install and reboot) * It has some risk. *Norton and certain security software may intercept to replace OS file with Full mode. If windows show blue screen after install KDW, you can restore system with copy install files from dllcache to system32. 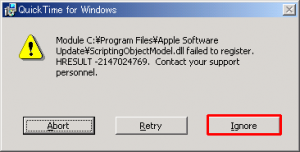 If you look following message "*.exe is not a vaild win32 application. ", fcwin2k can resolve the problem. And fcwin2k can patch automatic to msi file(Windows installer file). 1. fcwin can customize IE User Agent. I will explain usage of this software. Hi, Which version do you want Simplified Chinese or Traditional Chinese ? 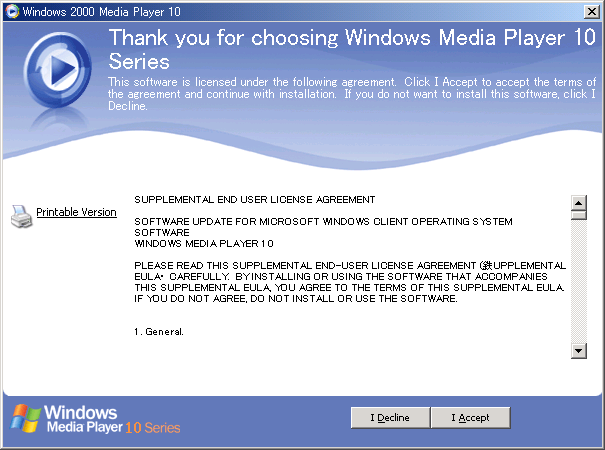 Hi, today released WMP10 installer for windows 2000 build 4063. * Included more 12 hotfix. Does this work if you use KDW in "EZ" mode, or do you have to actually replace the system files? I released Simplified Chinese Version WMP10 installer for Windows 2000.
and English and Japanese version fixed bit. I found there are a few localize mistake in inf files. The release version is Build 4063a. Here is KDW manual before install WMP 10 for Win2000. At first, Please check user system file version about Kernel32 and Advapi32 and shell32 and user32. Compare to these files version in this image. Next, Check SHFolerEXREG and push 5 "Inst"buttons for instal, and Press "start Setup". After reboot, Perhaps there aren't completely installed, then retry to install files' which aren't installed. This image is status where it can do preparation to install WMP 10 for Win2000. You may be able to use Ez mode after install WMP10. At first Uninstall 4 files, kernel32, shell32, user32,and advapi32. and please set Ez Install to folder "\Program Files\Windows Media Player". If you want to use activeX, please copy iexplore.exe to "\Program Files\Windows Media Player"
and start from \Program Files\Windows Media Player\iexploer.exe when you want to watch Active X contents. You can use foobar 2000 v 9.5.x. Next select OS Version XP, and press 'Compat Save'. Then you can install foobar 2000 on your Windows 2000 PC. You may delete this Setting to press CompatDel , after finished foobar2000 installation. foobar 2000 9.5.x requires extra function in user32.dll, shell32.dll, and uxtheme.dll. Therefore you have to install 3 KDW Dlls. * Set Ez Install folder. * Check EZ KD Registry(Required reboot system) and SHFolder EXREG. Of cause you may use full install. 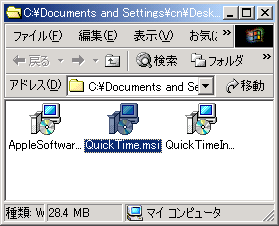 At first, extract Quicktime.msi from QuicktimeInstaller.exe. For example I used 'eo'. Next please run fcwin2k and D&D windows and check 'allow win2k' and 'overwrite' and 'msi exec'. Perhaps such Error dialog may appear. QuickTime requires extra function in shell32.dll. And you must run fcwin2k again and rewrite 'Program Files\QuickTime\QTSystem\QuickTime.qts'. Check 'checksum', 'Ignore File Ext', and 'Special Rewrite', and press 'Rewrite'. Then you can use Quick Time 7.50 on Windows 2000. Just tried installing Quicktime 7.5 following the above, but when the installer ran, after telling me which folder it was going to install to, it just went to the following error message, and wouldn't go any further. I tried again after using ez install to put your shell32.dll into the folder, but it didn't make any difference when I tried to install again. Did you check Ez KD Registry, and reboot PC ? 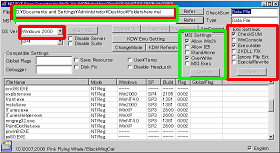 Shell32.dll is one of Known Dll, and Windows Preferential load system32 folder Dll rather than current folder. 'Ez KD Registry' checking effects to make ignored Known Dlls. Thanks to your contribute to the chinese editon of the windows media player 10 but when i installed the kdw in my chinese 2k the speed of the start was too slow and the program "QQ" (http://dl-sh-ocn-1.pchome.net/0g/2w/QQ2008KB3.rar)did not run as well. Maybe somewrong with it ? I've tried that, and everything seemed to do what it should do. Your shell32.dll and shell2k.dll are in the Quicktime folder. The "ExcludeFromKnownDlls" registry key contains kernel32.dll, user32.dll, shell32.dll, and advapi32.dll. Still getting the same error message when the installer runs. GetQTProcessCount() reported 0 QT active processes. 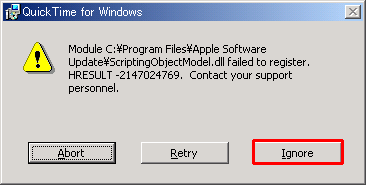 QT DLL path: "C:\W2K Program Files\QuickTime 7\QTSystem\QuickTime.qts"